Roxane Lucas is 18 years old and one of the promising figures of France’s longboard scene. Sweatshirt: Pull & Bear. Tee-shirt: Steam. All Images by Corinne Stoll. Competitive since childhood, this accomplished athlete who has raced, practiced horse riding, gymnastics, fencing and rock climbing, applies a rigorous approach that identifies her to the Californian way, often described as the girls method by the skate community, that is nonetheless physical and demanding, but also fun. Roxane: The very first was GRS (rhythmic and sport gymnastics) at around 6 to 8 years old and horseback riding just after. It was more my parents decision but this did not prevent me from enjoying it, discipline has long been one of my strong points. R: I really had my hand in a lot of different activities, whether it was gymnastics, fencing, rock climbing, but there are two that really made their mark and continue to inspire me: running and longboarding. At the age of 12 I started running 2 and 3 km competitively, making it all the way to the French Championships with my girls’ team during high school. Running pushes you to excel and to have an above all else determination. What an incredible feeling at the end of each training session! But last year I discovered a sport that deterred my love for racing: longboarding. Longboarding was invented by Californian surfers who simply had no waves to surf. They placed skateboard wheels on a surfboard, this led to the longboard we know today, wide and long. The aim is to skate in the most fluid and natural way possible while performing tricks. I discovered this sport through DockSession, a weekly meeting created by Lofti Lamaali in Paris to join and grow the longboard community. Longboarding requires as much self-determination and capacity to excel than running. But what I enjoy is the creative aspect that running doesn’t have. On the board I am free to create my own combination of movements or tricks. Every style is unique. I/O: An emblematic sports figure? Or one who impressed you? R: I wouldn’t say a figure in particular but rather a group of women, the Longboard Girl Crew who supports women who longboard. They have really been an inspiration for me and have formed the vision I have for the sport. I/O: Do you feel a unique emotion during or after skating? R: I think of every new trick I try time and again. The moment I succeed is amazing. Longboarding allows me to express myself. I feel so good when I am on the longboard and dancing to the rhythm of the music. Regardless of the stress and my mental state, the minute I am longboarding my whole being relaxes. I/O: Does leaving your comfort zone help you face the rest of the day? R: It is true when I excel, surprising myself at times, it naturally gives me energy and the desire to do even better next time. R: Right now finding balance in my life is a challenge, as I am in a CPGE (preparatory class for university) and the work load is demanding. I longboard with my friends from DockSession whenever I have the opportunity. Longboarding allows me to stay balanced mentally as well as physically. It is good for me to go outside, excel and I make the most out of it, giving 1000%. I/O: Do you practice any other sports? If yes, why? R: I had to make a choice when taking up longboarding and I preferred to leave running to the side, though I haven’t entirely stopped. I have always loved dancing! I am always the first on the dance floor! But I wouldn’t say dancing is a necessity for longboarding. R: Everything is possible, never give up and give it your all to never have any regrets. Sweatshirt: Pull & Bear. Tee-shirt: Steam. Jeans: Mango. Beanie: Wasted. Shoes: Supra. Watch: Casio. R: Exercise has become important to Parisians. Especially when it comes to fitness and running which is becoming increasingly mainstream, surely with the ‘fit girl’ being in fashion and all over social media. In any case it is agreeable to meet more people who are practicing sports. On top of it all it is an opportunity to go out, escape and let go of the stress of life in Paris. R: Sports and exercise are becoming mainstream for the Parisian. I think it’s really great. To play sports shapes your character and life view. And I think this life view is being adopted more frequently. I/O: And the attitude towards skating? R: I started with Penny before starting longboarding. It really is in fashion, surely because you can bring it anywhere. I thought it was great, but it was before discovering longboarding with which it is much easier to progress despite what one may believe. I love to stroll the streets and see children with their Penny or longboarding. This summer I hosted an activity for children between 8 and 10 years old, a longboard/penny event, as many boys as girls participated. I had really good feedback. At the last DockSession I taught a girl to do the cross step, in the very same place I first learned this trick longboarding. The attitude towards longboarding is improving. I am ready to do all that I can to share my passion and make sure that my sport is accepted and loved by Parisians in general regardless of their age. I/O: Paris is a city that appeals to the skate community, why? Is it due to the city’s architecture, for its intellectual appreciation of culture and image? R: Paris is a beautiful city, full of art and creativity, a true source of inspiration. I love finding new original places to ride. Skateboarding, like longboarding, has always been close to art and culture. This can be seen across Paris, where skating is practiced in beautiful locations, especially at Trocadero which has been a skate spot since the 70s, as well, as near the Museum of Man, who has a view on the Eiffel Tower. I/O: Is this linked to the Parisian attitude? R: Some Parisians make assumptions about longboarding but all it takes is a visit to where we practice to realize that it is truly alluring. Parisians are our audience. They enjoy the show. I/O: How do you perceive the evolution of fashion sportswear? R: The skate style has come back to fashion. For example the brands Vans or Nike SB who are both very popular amongst skaters and those following fashion sportswear. I/O: The exercise French Touch, what is it? I/O: Your favorite sports accessory? R: The beany when I am skating. Practical and cool! R: In terms of fabric, I like having a longboard that is wide and long enough to not have any problems, a quality that both brands Bhangra and Loaded have. I/O: A well being tip or exercise must have product? R: I would say always carry a bottle of water. I find this super important regardless the exercise. I/O: A hairstyle fit for exercise? R: I have the tendency to tie my hair up when I am training intensely, otherwise I leave my hair unattached and I put a beany on. R: Life is more beautiful in color! I am not at ease dressed all in black but neither being too flashy. Let’s say an in-between. I/O: A skate destination on your travel list? R: I would love to go to Australia to longboard, surf and visit the country! DockSession has developed internationally, present in Japan, Spain and Brazil. I would like to visit each of these locations to meet the community. I/O: Has YouTube changed longboarding, and if so, how? R: Yes, I discovered the Longboard Girl crew through one of their videos shot in Madrid. YouTube is a promotional tool and it creates a following. This makes it possible to discover and promote longboarding internationally. R: I will again reference the Longboard Girl Crew, but they are the first to come to mind. These women promote and gather women participating in action sports, especially longboarding. Their videos and initiatives provide a different image of women, one in action and in sports. It is a cause that I hold close to heart and want to promote. I/O: Do you have a crew of girls with whom you skate or not at all? If yes, what is the benefit? 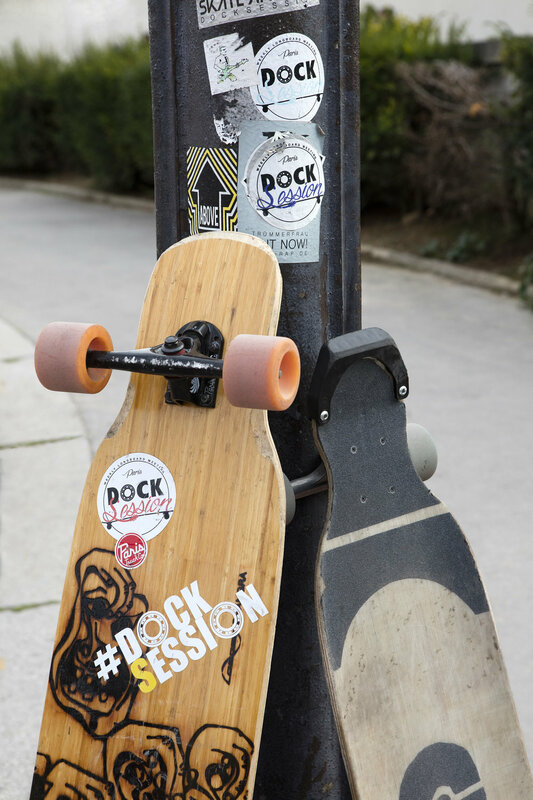 R: I skate with DockSession, women and men are mixed. I have only known mixed crews but why not try a session with just women. All there is to do is test! I/O: Do you think the skate world is changing their attitude towards women? Do you find they are more accepted? R: Yes, truly. Women integrate easily. Men are adorable towards us. In any case in longboarding women are very well accepted. I/O: Does skating give you the impression of belonging to a community? R: Whether it is as a part of DockSessio nor the Longboard Girl Crew, longboarding has really given me the impression of belonging to a community, a welcoming and joyful sphere, where the first rule is fun. I/O: Is this a sport you see yourself still practicing in 5 years? In 10 years? R: Of course! Until my legs are no longer capable! It really is a sport that fits me. I have fun, meet new people and share wonderful moments, so the question rather would be, why stop? And you, behind your screen when are you going to start practicing? Sweatshirt: Pull & Bear. Tee-shirt: Steam. Jeans: Mango. Beanie: Wasted. Shoes: Supra. Watch: Casio. 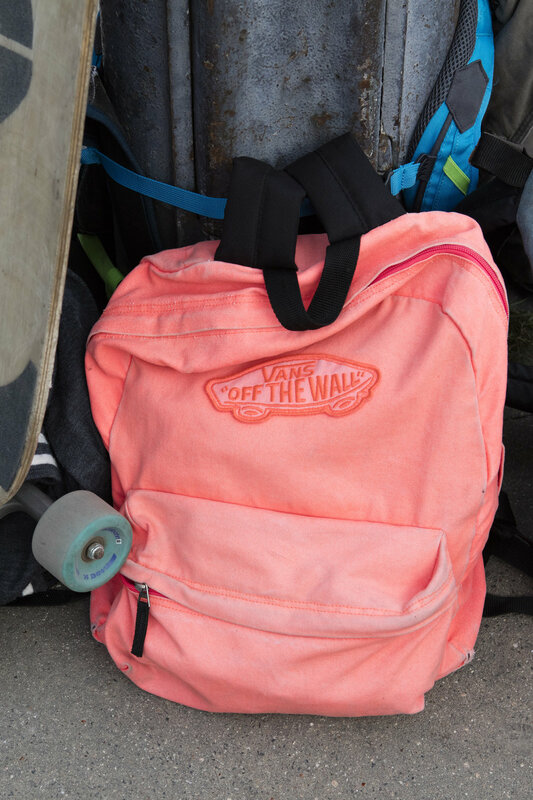 Backpack: Vans. 1 advice for obtaining the greatest benefit in ones training: 1) Always believe and never give up. 2) There is always something to improve, nothing is ever perfect, everything can always be quicker and more fluid. 3) HAVE FUN, this is really the main point. 1 playlist: I am often changing my playlist but it says in the same theme as ElectroNOW and Indie Pop! On Spotify. 1 power song: "Hips don’t lie" by Shakira always gives me energy! 1 blog/website: The DockSession Facebook page to be kept up to date of new sessions! 1 person we should interview: the Longboard Girls Crew!